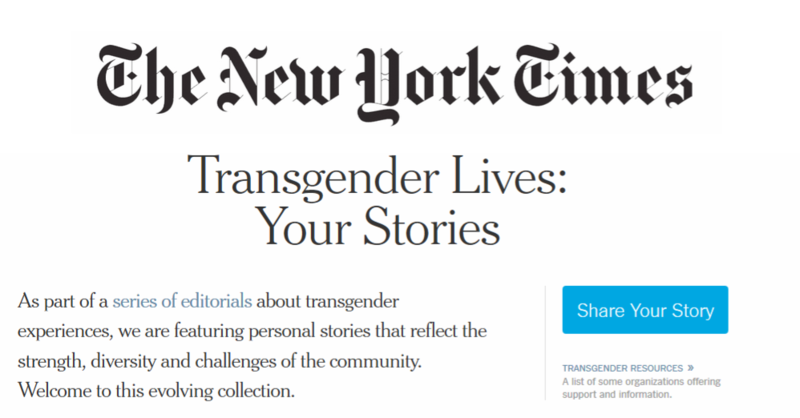 I saw that the NY Times, on-line edition opinion section, was collecting transgender stories. The many stories and photos that had been collected were outstanding. There should be no question that we have come a long way when the NY Times is willing to publish our stories about who we are, our accomplishments and recognize us as prominent contributors to society. Thank you, New York Times. If you would like see the collection use this link. If you would like to read my story as published use this link. Thank you for such an awesome find. I have saved the URL and I know I will be spending many hours reading their stories. I love your blog and look at it everyday.